Independent garages are cheaper than those run under carmaker franchises. 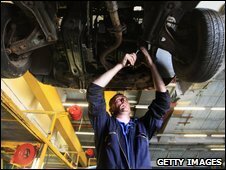 UK garages have increased the average price they charge to repair vehicles in the past year, despite the economic downturn, a survey has suggested. The average price per hour of a mechanic's time rose from £75.17 to £75.85, said insurer Warranty Direct. There was an almost 5% fall in labour rates charged by franchised dealers, however cheaper independent workshops raised prices by 0.8%. Average rates varied from £94.44 an hour in London, to £61.65 in Cornwall. The overall UK average franchised garage charged £90.16 an hour, while the typical price for an independent firm was £56.10. The survey of 5,000 premises uncovered rates peaking at £190.35, however this was considerably below the high of £198.86 seen a year ago. Motorists should shop around to "avoid being stung badly", said Duncan McClure of Warranty Direct. He added that the prices charged by franchised dealers had become "unsustainable" and so had begun to fall. "The way some workshops were increasing their charges year after year couldn't continue."